Questions just about every writer has asked him- or herself: Just how many words does it take to make a novel? Is there a certain word-count? And how do I know if my novel is too short/long? But now we’re left with a question – what is the standard word-count for novels? Is 50K typical? How many pages is 50K? To answer the latter question – the average WPP (“words per page”; not an official acronym, at least to my knowledge) is 300. So, according to my handy-dandy calculator: a novel with 50,000 words is likely to be around 116 pages long. That isn’t a very big book. According to my previously mentioned research, most of today’s novels tend to be at least double that, at a whopping 100K. Goodness, that’s a whole lotta words! You may be picturing that as a fat, monstrous book. But (depending on the formatting, of course) it’s really not. However, this isn’t to say you should do 100K; in fact, there are tons of successful novels that fall very short of that. To put into perspective how big your novel might be in final print, I’ve rounded up the WCs of popular bestsellers (in order of date published). 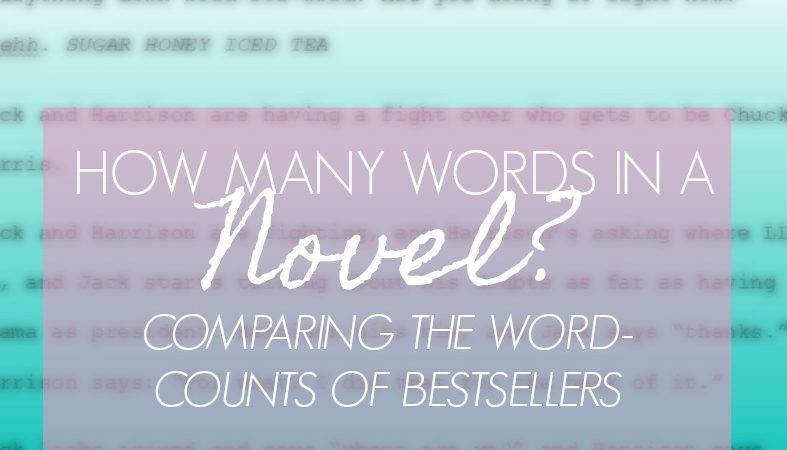 You probably have at least one of these on your shelf, so you can compare and contrast with your own novel to get an idea of just how many words you want it to be. Please remember that several sources said different word-counts for each of these books, which is why I put “about” in there so much. A very super important note: do not, I repeat, do not feel bad about your novel’s WC. When I started this research, I made the mistake of harshly comparing my novel to others, and with a bruised motivation I lost several days of writing. So please, I beg of you – don’t be cruel to yourself. Pages (paperback): about 208 pages. Pages (paperback): about 256 pages. Pages (U.S. edition): about 368 pages. Pages (U.S. edition): about 870 pages. Pages (paperback): about 576 pages. Pages (paperback): about 374 pages. Pages (first edition): 487 pages. If your novel is too short, it might be a sign of underdeveloped plot. If it’s too long, you may have useless filler. So the length of your novel is an important subject, but again: don’t fret over it, okay? If you need to shorten or lengthen your novel, there are some good articles at tauricox.com that may help! Let’s talk! How many words is your novel, or how many words would you like it to be? Are you happy with it, or do you want to change it? Thanks so much for the mention, Sam! Great article! No problem! I loved those posts you wrote. 🙂 Thanks for the feedback! Hey, Sam! Great post! I’m still a little worried about my plot, but I’m sure it’ll be fine in the end. I need to work on connecting everything, and having a main theme if that makes since. I don’t really have a plot right now, but I think I’ll have one soon, so that’ll be great! Anyway, great posts lately! Bye! Hey, Aynsley! I get what you mean about plot; I know what goes into it, but actually writing it becomes another problem, you know? But I’m sure you’ll figure it out! 🙂 Thanks for commenting!